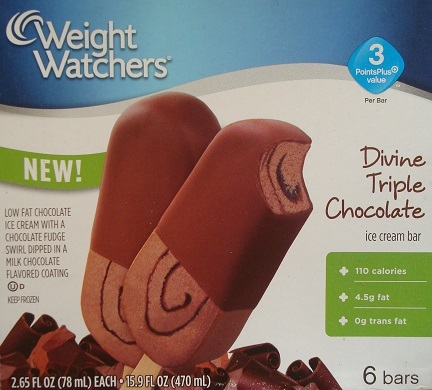 [By Nick, new for 2012] Next up in my conquest to try all of the Weight Watcher’s ice cream products is one of their latest additions, the Divine Triple Chocolate ice cream bar. I’ve already review all of the other varieties of partially dipped bars so it’s the same make up as those bars. Weight Watcher’s takes low fat chocolate ice cream, swirl in some chocolate fudge and then dips the bar in milk chocolate. I normally stay away from things with so much chocolate just because it tends to get overbearing. If you love chocolate, you are going to love this bar. It’s literally chocolate on top of chocolate on top of chocolate. Sure it’s hard to really distinguish to different chocolate components but there’s a nice milk chocolate vibe taking over the whole bar. Like the other bars, the shell adds crunch while also adding to the milky qualities of the bar. The chocolate ice cream is surprisingly creamy and shows no signs of chewiness which much too often plagues low fat treats like these. If I didn’t see the fudge swirl I really wouldn’t have known it was there. It doesn’t really separate its flavor from the other chocolate components or add any change in consistency either. Normally I find these bars a bit too small but I’d say these are the perfect size. If they were any bigger I’d probably fall into a chocolate coma. My only major complaint is the whole not being able to tell the chocolate apart from one another. If they had gone with their dark chocolate shell it would’ve added some bitterness and depth. I could see these becoming my favorite of their dipped line if that was the case. Still that’s not much of a complaint when these bars are quite delicious as is. I have to hand it to Weight Watcher’s on this one. They made a “healthy” bar that will seriously calm any chocolate cravings you have. I have bought these a couple of times, and I agree they are very tasty for a low calorie ice cream bar. I love these and usually buy at Walmart. they haven't had them in two weeks. What gives. I also like the latte bars and can't find those anymore either.